While growing up my mom was a single mom raising two kids and working full-time. She didn't have a lot of time or money to prepare elaborate meals, but she always used the freshest ingredients possible, made every thing from scratch and surprisingly we ate a wide variety of cuisines. She had and still has a great palate and is one of the hardest people to impress when cooking. Since my mom is now 82 years old, my sister cooks for her and my sister will call or text me saying that mom thought her dish needed more seasoning, etc., etc. I tell my sister not to take it personally because mom is one tough food critic. Whenever I visit I always cook for my family and I'm always nervous cooking for my mom, even though I cooked in a professional kitchen. Some of the best chefs in the world are home cooks and mom is definitely one of them! Since we didn't have a lot of money growing up, we ate this soup frequently because it was so hearty and filling. I remember that my mom would yell at my sister and me because we were constantly in the kitchen eating the noodles out of the soup pot and there would be no noodles left when we sat down to eat dinner. And I guarantee that you'll do the same if you make the noodles from scratch. Also, growing up this soup was made with chicken stock, but since I'm vegan, no animals were harmed in making this soup and it tastes just as good, or even better than I remember. And I think that my mom would like it too! I mentioned in a previous post that Pennsylvania "Dutch" really means "Deutch" and refers to Germans who immigrated to Pennsylvania, especially to the Lancaster area. 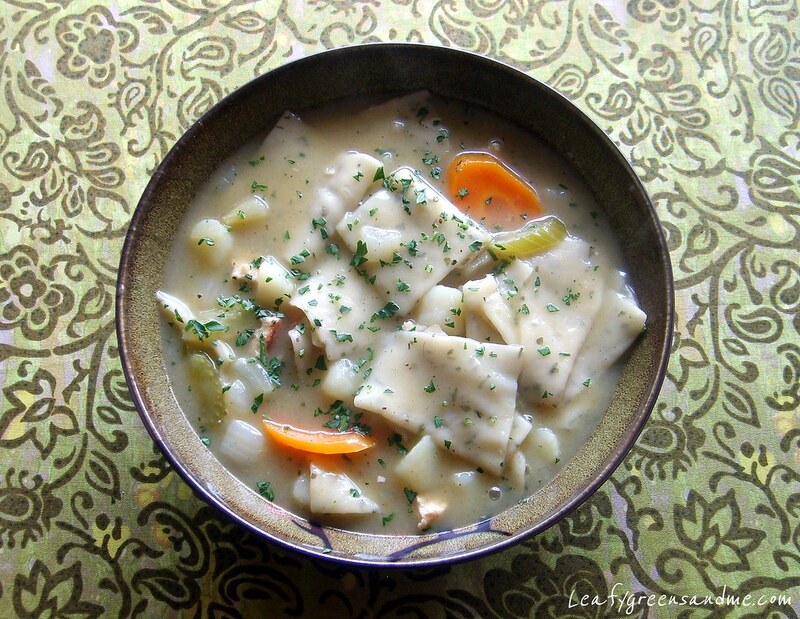 Most people who think of potpie automatically assume it has a pastry crust, but not the Pennsylvania Dutch style. It's really just a creamy stew thickened with homemade noodles. In a large stock pot, heat canola oil on medium heat and add chopped onion, celery, carrot and parsnip and cook for about 10 minutes until vegetables are soft. Add the remaining ingredients, bring to a boil, reduce to a simmer and cook for about two hours until stock has reduced in half. Strain stock into another bowl, clean out stock pot and return stock to pot. You should have 8 cups of liquid. If less, add additional water to reach 8 cups. In medium size bowl, add flour, kosher salt and parsley, stir to combine. In a small bowl whisk together egg replacer and water. Form a well in the center of the flour, add egg replacer mixture and 6 tbsp cashew milk and form mixture into a ball with your hand, adding additional 2 tbsp of cashew milk if needed. On a lightly floured surface knead dough until smooth, about 5 minutes. Divide into two pieces, form into a ball and wrap and let sit for at least 30 minutes before rolling out. 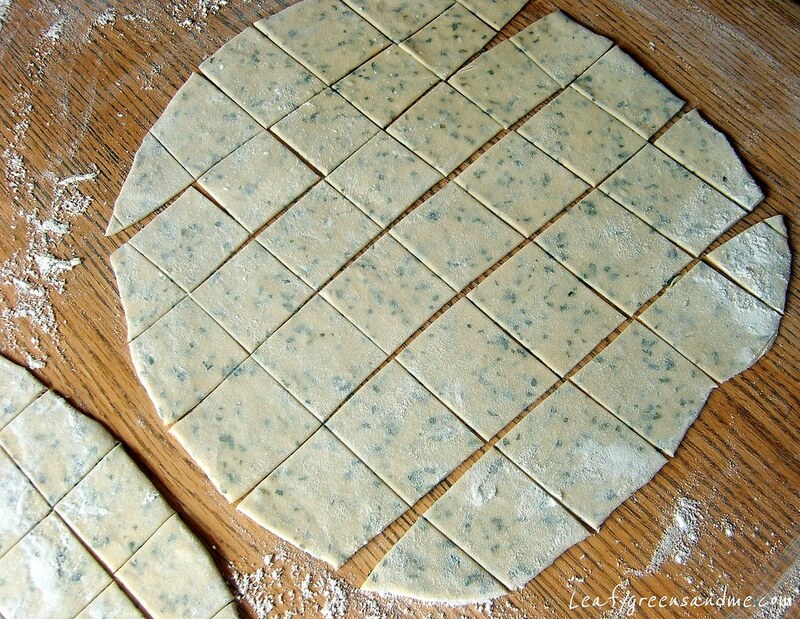 When ready to roll out, lightly dust a board with flour and roll dough into a square shape about 1/8"-1/16" thick. Cut with a pizza cutter or knife and let sit out until ready to add to soup. Note: If you purchase noodles instead of making them from scratch, you'll need to add flour to thicken the soup. You can do this by adding a small amount of flour and cashew milk to create a slurry and then stir it into the soup. The soup will thicken up while cooking. Also, you can add diced Gardein "chick'n" to the soup. I prefer the soup without it. I tried a sample and felt it didn't add any additional flavor and I didn't like the texture. Add onion, celery, carrot, potatoes, fresh thyme, poultry seasoning, chicken flavored seasoning, and salt and pepper to the broth. Bring to a boil and reduce to a simmer for about 20 minutes until vegetables are tender. Bring soup back up to a rolling boil and add homemade noodles, stirring to make sure that they don't stick. Reduce heat to a simmer and cook for about 10-15 minutes until noodles are tender. Add fresh parsley and additional salt and pepper if desired. I made the soup but subbed matza balls. So yummy. Thanks for this great recipe! Anna, glad you liked the soup. I was thinking about making a matza ball version--you'll have to give me the recipe! Amymylove, if you make the noodles from scratch, try and use a cashew cream instead of soy or other non-dairy replacement. Cashews have a higher fat content, similar to heavy cream and whole milk and will make the noodles fluffier. Let me know how they turn out. Thanks for the compliment! Perhaps I will have a cookbook one day!